Fork skin of potatoes and bake until soft, about 45 minutes. When potatoes are done baking slice open and remove insides. Using a fork or pastry cutter break potatoes up into small pieces and spread out in a thin layer on a cutting board. Let cool for 15 minutes. Sprinkle cooled potatoes with ¾ cup flour, egg, salt, and pepper. Using a pastry cutter or fork mash into potatoes until egg is distributed throughout the potatoes (the egg yolk will give the potatoes a yellow tint). Gently fold dough with a spatula or pastry scraper until it is crumbly. Gently knead the dough adding flour 1 tablespoon at a time until it is moist but not sticky. Divide dough into 8 pieces and roll out into long rope shaped pieces about the width of your thumb. 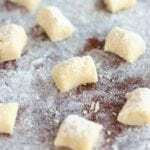 Cut dough ropes into ¾ inch pieces and dust with a little flour. Arrange in a single layer on a cookie sheet and place in the refrigerator until ready to cook, at least 30 minutes.